What an interesting statistic this tournament has produced: the most number of consecutive wins at a football tournament (Regional or World Cup). The record is ongoing, currently sitting at 24 games in a row (ie. all matches in the Group Stage) ending without a draw! It has comfortably displaced the old record of 18 games in a row set at the 1930 World Cup in Uruguay. I should note that I have watched most of the teams play and I think the quality of football hasn't really been that great, with only the favourites (and those who have progressed to the knockout stages) standing out - something so obvious it probably goes without saying. Should be a close match, given that Uzbekistan breathed down the neck of the Koreans in the previous World Cup Qualification campaign. South Korea should take it based on experience and form but I would love to see an upset here. Prediction: South Korea 2-1, though I would like Uzbekistan to win. Iran have a good record against their neighbour rivals so should take this one out. They have a good defensive lineup too. Not an easy match for the Socceroos. 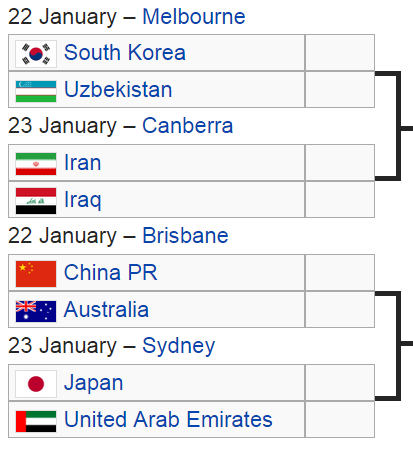 I think Australia will be hurting from the last match; we will want to make quick amends after our loss to South Korea. In terms of setting up goals, Australia played quite well against South Korea. However in terms of their man-marking for the conceded goal and their execution/finishing of chances, they were left wanting. Australia's defence was always going to be the problem. I expect slight improvements in these areas to be enough for Australia to scrape past China. Prediction: Australia 2-1, with the Socceroos to concede an early goal? TV ratings should soar for obvious reasons? Japan should edge the UAE comfortably given the talent in their squad, even though UAE likes to play forward through Omar Abdulrahman. All my choices, as you can see, have unashamedly been very safe and predictable: I look forward to being wrong.